Decorate With Unique Long Stars! These 5 point long metal stars are unique, popular, hard to find and here they are! 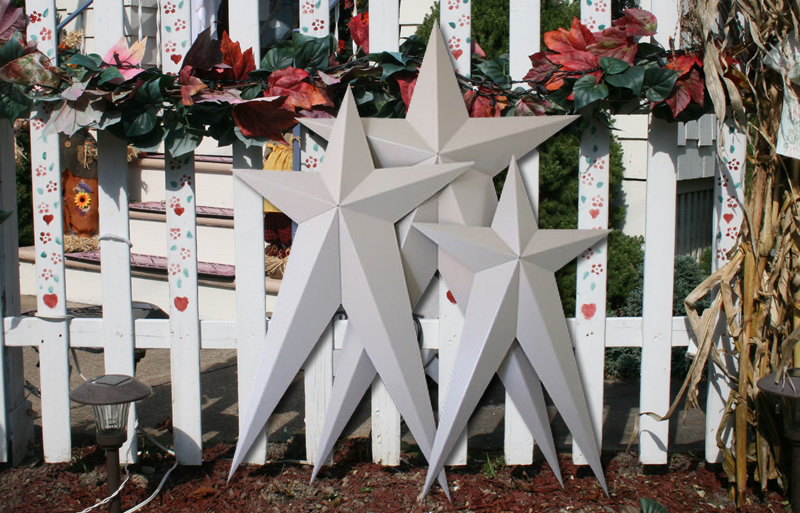 Stars represent freedom and with these primed Amish metal barn stars you have the freedom to let your creativity take charge. Paint your own Americana metal stars, patriotic stars, or even solid color stars to match your home decor. The possibilities are endless. These metal barn stars are covered with an Industrial strength gray primer and ready for you to paint or decorate upon arrival for your metal stars decor. 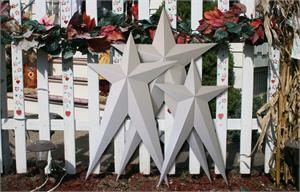 Sometimes known as tin barn stars but our HEAVY DUTY metal stars are not made from cheap thin tin. We are sure you've seen the cheap tin barn stars in stores and when you pick them up you can feel how flimsy they are. Use these non-rusting galvanized metal stars to create a really unique design in your country home decor. You can use stencils, decals, your walls for metal wall stars, create your own barn star art, and paint them the color of your choice. Let your barn star art imagination run wild! So let's decorate your home with Amish metal barn stars.